This passage from Birgitta’s Vita has been central to the interpretations about Birgitta and Master Mathias’s (b. ca. 1300–d. ca. 1350) relationship. 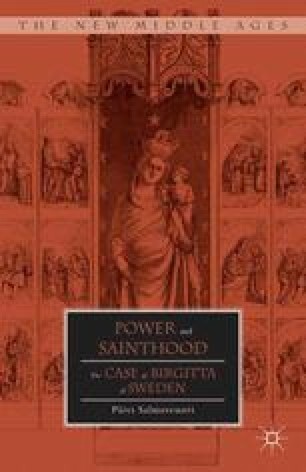 According to this text, Birgitta’s reason for going to Master Mathias, who was already her confessor, was that he had the ability to discern the authenticity of her revelations. Birger Bergh, for example, sees the text as containing the keys to better understanding Birgitta and her actions that followed.2 Claire Sahlin stresses that Birgitta continuously submitted her daily practices and spiritual life to her confessors’ direction and was dependent on their approval and their promulgation of her revelations. According to Sahlin, at the beginning of her career Birgitta “was terrified that the revelation was a diabolical illusion and received instructions to tell Master Mathias what it had revealed to her, since he was ‘experienced in the discernment of the two spirits.’”3 These views, no doubt, reflect the impression the authors of the Vita wanted to give.